Enjoy the great outdoors in comfort under the shade and protection of the 17' 0" awning! This 39' 8" long, 8' 6" wide 5th Wheel tows easily with a hitch weight of 2815 lbs! It has a sturdy GVWR of 16500 lbs. for years of fun! 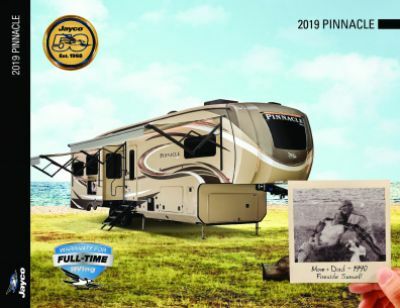 At 39' 8" long and 8' 6" wide, the 2019 Pinnacle 36KPTS is roomy and comfortable, especially when you open up the 3 slides that maximize the living area! You'll appreciate it so much when everyone is inside on those sizzling summer days, kept cool by the 15000 BTU a/c unit, or enjoying a toasty, warm evening together thanks to the 40000 BTU furnace! 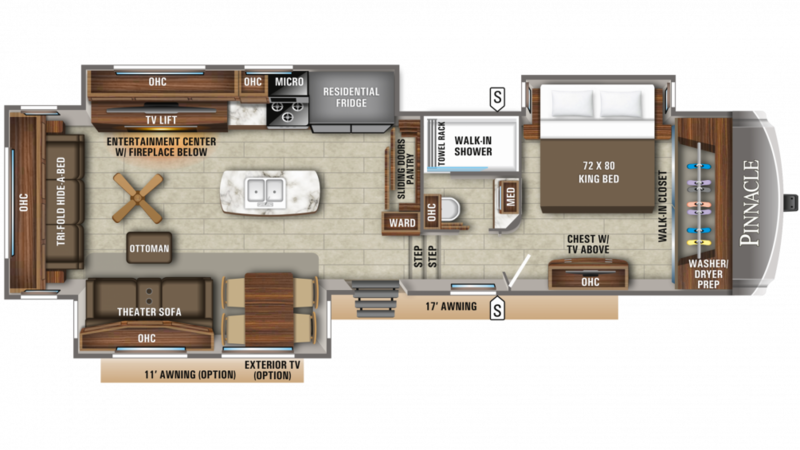 With all of the comfortable sleeping accommodations inside this RV, a family of 4 can find refuge at night! You and your spouse will be able to sleep in privacy in the master bedroom! It holds a wonderful, spacious King bed! Food just tastes better when you're on the road, and you'll whip up great meals in the kitchen! Cook up hot, delicious food on the 3 burner range cooktop and keep your favorite food and drinks on hand in the 21.00 cu. ft. refrigerator. Clean up is easy with plenty of hot water from the 75 gallon fresh water tank and the LP tank with its 60 lbs. capacity. Start your day with a hot shower, or wash off the day's dust in the evening before you hit the hay! You can do either every day in the beautiful bathroom of this 5th Wheel. With its modern shower, lovely sink vanity, and sleek Porcelain Foot Flush commode, you'll have all the privacy, comfort, and convenience of home!